When Bert Jansch died, I said here that I was going to make a list of the musicians I wanted to make the effort to see while I still had the chance. I never made the list, partly because it’s a bit morbid to try and come up with a list of musicians who you think might die soon, but mostly because I am lazy and don’t follow up on my promises. But someone who would have been on the list, because he was a contemporary of Jansch’s, was John Renbourn, who I am delighted to say I saw perform on Saturday night at the Union Chapel, and my goodness, it was terrific. 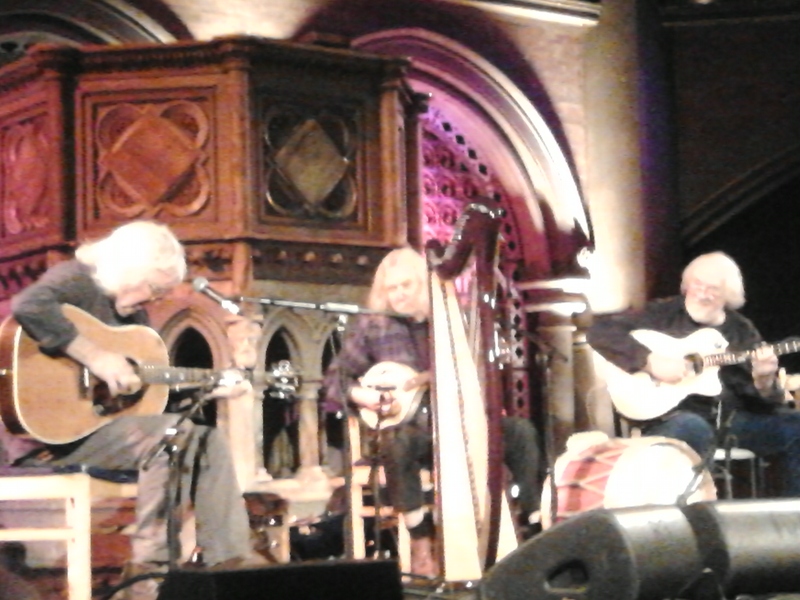 At the Union Chapel you can sit about twelve feet from the performers, so we did because when you are watching guitarists, you want to be able to see their fingers. John didn’t speak much (he had raconteur extraordinaire Robin Williamson, formerly of the Incredible String Band, to do that for him), but he made his guitar sing like a young Beach Boy, and seemed to do things with it that oughtn’t to have been physically possible. I am not a guitarist, but I had one seated either side of me, and they both agreed afterwards that there were notes in there which, even with three people playing (Wizz Jones was the third), seemed to come from nowhere at all. There is music which is designed to take you outside of yourself – prog rock, trance, punk – and there are musicians who can transport you to somewhere entirely new (I always think that seeing Bobby McFerrin perform live is the closest thing we have to evidence for the existence of a higher plane). And then there is music which takes you deep down inside of yourself, and for me that is acoustic blues and folk guitar. Sitting in the Union Chapel with a cup of tea and my coat still on because try though they might, it is not a well-heated space, I seemed to live my life again in a series of images and memories which the music evoked. Not because they were songs I knew – less than half of them were – but just because the very sound of them spoke to a half-hidden part of me, where unremembered thoughts and feelings live. I don’t think this is because I was a blues musician in a previous life, or because the music invokes supernatural presences: I think it’s because this is the music I heard before I heard anything else, and what it arouses in me is probably more or less the same set of feelings that any sudden sharp sensory link to my early childhood would, but that doesn’t make it any less interesting. I count myself lucky to have been brought up by this music, because there is something timeless about it – I joked on the night that we were the youngest people there but we weren’t, not by a long way – and I’m not sure it would be the same if my earliest musical memories were of the Village People or Boney M. There are other types of music which transcend their time, of course – jazz, classical – but their time was earlier. Davy Graham, Bert Jansch and the three white-haired geniuses I saw at the Union Chapel were living, breathing artists when I first heard them, all the more so to me because the way I first heard them was not on vinyl or cassette but on wood and steel, tapped out by my dad on his own guitars. This music made me, and it was a privilege to be able to see it first-hand. I didn’t record any of the show, because that would be rude, so here instead is a lovely video from the olden days. what a lovely moving piece. as moving as the music you heard, this weekend and decades ago. One speechless Dad has just signed out.